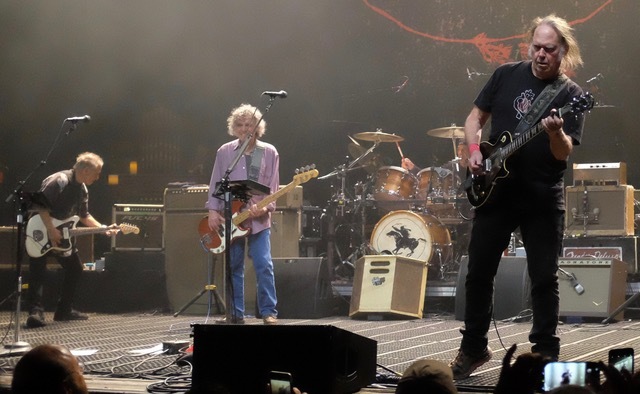 Neil Young says there are “four or five Crazy Horse albums that have never been heard, that are sitting there ready to come out,” in an interview with Yahoo. Neil Young also discussed an animated film for the album Trans. The film was never actually created because Geffen Records “pulled the funding for the videos because they didn’t like the record.” He now plans to produce and release the 35-minute film with Micah Nelson. Full interview with Neil Young on Yahoo. I count Early Daze, Odeon Budokan, Garage, Toast, and Alchemy. I don't see Dume in the timeline. I recall an article I read a while back where he stated he would 'empty the barn' or something very similar, that he had intentions of unloading it all. Well, time's getting short, lets hope he means it! For this Crazy Horse fan, listening to Roxy TTN is like a hit of pure oxygen. I have to tie a Rope to my waist every time I listen to it. Bring It On Neil!!! There are 5 NY&CH records on timeline that are unreleased. Wonder if they'll be released as physical copies too? Toast!!!!!! @ Art - thanks for correction. Post updated. So did you guys make any of the NYCH shows?! Why is there no news about the Detroit Solo show coming up? Please tell me how you know he’s playing solo? Can’t find any info on it - thanks! I finally found tickets for the Detroit solo acoustic show and was super excited until I saw the prices! Made Radiohead seem pretty reasonable! And I make thousands of dollars a year! I was pretty excited about seeing him again until tickets for $250-$1200 blew my mind. I'm dying for the Crazy Horse albums though!!! @John Tewks You know you don't have to buy the most expensive tickets, right? You can get a ticket to the Detroit show for $49 ($67 after fees). And it's not like he's playing in a stadium, it's a theater so even the cheap seats aren't terrible.